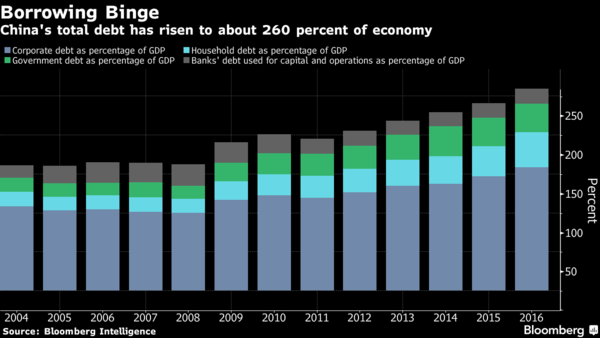 China’s financial system is becoming significantly more vulnerable due to high leverage, according to central bank governor Zhou Xiaochuan, who has made a series of blunt warnings in recent weeks about debt levels in the world’s second-largest economy. Latent risks are accumulating, including some that are “hidden, complex, sudden, contagious and hazardous,” even as the overall health of the financial system remains good, Zhou wrote in a lengthy article published on the People’s Bank of China’s website late Saturday. The nation should toughen regulation and let markets serve the real economy better, according to Zhou. The government should also open up markets by relaxing capital controls and reducing restrictions on non-Chinese financial institutions that want to operate on the mainland, he wrote. The latest in a string of pro-deleveraging rhetoric from the PBOC, Zhou’s comments were speculated to have contributed to a rout in Hong Kong shares. They signal policymakers remain committed to the campaign to reduce borrowing levels across China’s economy. Concern that regulators may intensify this drive after last month’s twice-a-decade Communist Party congress helped push yields on 10-year sovereign bonds to a three-year high. Chinese bonds seemed to shrug off the essay early Monday, with 10-year yields down one basis point to 3.88 percent as of 11:14 a.m. in Shanghai, while the cost on five-year notes rose one basis point to 3.95 percent. Hong Kong’s Hang Seng Index slumped the most in two weeks and the Shanghai Composite Index fell for the third day in a row. The PBOC chief’s essay reads more like an explanation of existing priorities than a sign they’re changing direction or pace, said Bloomberg Intelligence economists Tom Orlik and Fielding Chen. China may shift slightly toward a tighter stance, but macro-prudential rather than monetary policy will do the legwork to limit financial risks, they wrote in a note. Despite the tough rhetoric around deleveraging in China, measures of credit continue to show expansion, with aggregate financing surging to a six-month high of 1.82 trillion yuan ($274 billion) in September. Corporate debt surged to 159 percent of the economy in 2016, compared with 104 percent 10 years ago, while overall borrowing climbed to 260 percent. NextIs $60 oil too tempting for OPEC?